Well everybody would have had their chances to play the popular game “The Angry Birds” in various platforms like mobile,on line or game consoles. Where the angry birds kill the pig “Bang” on target ,well I am no exception from this popular game.Actually I am in a sort of in anger mode even after i quit the game(well i couldn’t kill the pigs in a certain stage)well that’s that! no regrets just a game.Well what about the birds in the real world,well what about them? you might wonder, well even while your playing the game in your mobile killing the pigs in game scenario ,your actually killing the birds in the real world,yes you me and the guy sitting next to you in a public transport who never cares to take a look at you rather than his or her mobile display are all a part and parcel of this crime and it might be happening even while im typing this!Even before everyone realises it might be game over for the real birds with new mobile segments coming up in the market with various features that has nothing to do with communication which is what they are for! Ultimately resulting in the increase in Mobile Towers in every locality which is gonna result in a mass extinction of birds and their natural habitats.Well you don’t have to be an Avian Expert to detect these changes, just look up the sky and the tree s(if there’s one) near your home for sign of life ,its changing in a very negative way! I can say I am a Bird Watcher,I don’t remember any morning without the sweet sound of birds,now their voices are depleting and sometimes stern silence is the answer i got when I searched for their sound!What is more disturbing is the fact that more than 60% of the urban area and the 15% of rural area is covered by mobile towers in India amounting to nearly 3 lakh towers across the nation,imagine the amount of mobile phone users increasing everyday and the number of mobile towers might pop up everywhere!What we have done here is disabled the whole inborn navigation system of birds via these microwave radiation avoiding the magnetic field from the earth(the mode the birds used to navigate).Let me give you an classic example of extinction “The Common Sparrow” is no more to be found where they once lived in abundance! 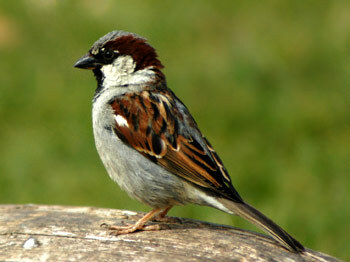 I remember 3 or 4 years back then common sparrows living and visiting the garden in my home and even lived in one of the artificial nest that we’ve created in our home.Now its a part of extinct history and old news,actually i see their presence in news paper articles and images from the internet not in real life form! The year of their disappearance is proportional to the appearance of Three Mobile Phone Towers in our locality each of them in a Triangular position,reminds of mythical killing style ritual symbols! Leave alone that, The Angry Birds I Wanted to emphasize here is about every type of Birds that I watched and classified (even though i cannot name them) their presence here.There are over 5 types of birds that ive tend to bump in any given day near my locality and especially near my home and inside our garden.And i also remember the strange Thing that i never missed here for the first three to four years of my life in our Newly Built home,Every morning i wake up to Knock on the Window panes from a Avian Visitor “A Raven” yes off course its a black crow.Its actions were quite spontaneous and it wont miss a day in knocking our window panes early morning,initially i thought our home was built in the way of birds flightpath or it was too high as a distraction for birds,but soon other crows followed suit.Half a dozen did the same thing in the same window for the next 3 years to come. Now Nearly 6 whole years of that i find other birds doing the same ritual except in different windows.Joining Angry Bird Brigade are mynas,type of humming Birds,Robin-bird,Grey sparrows and even a Woodpecker the latest to add on to the list of Angry Bird Avian s attacking Our Windows whenever possible. 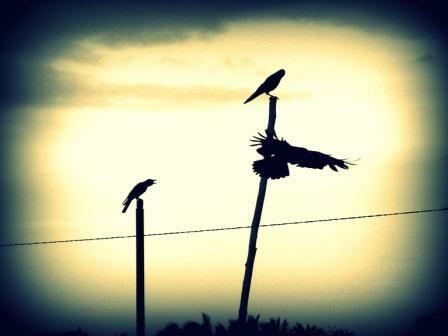 In fact there is no harm done to us nor i am worried about being attacked by them.All I am worried about is how they have fallen prey to the telecommunication Mast in our locality.Similarly other strange behaviour that i find among these birds is the tendency to make nests in two or three places and they don’t live there. Even if some live ,they don’t lay eggs or there seems to be no harmony among themselves.They are always agitated by something and aggressive.My observation here is about five types of Birds with the same kind of behaviour changes.All i sense here is a lot of Angry Birds who have lost their natural way of living and even extinct as in the cases of Common Sparrow due to radiation emitted by the Mobile Towers.New kind of mobiles can be reproduced by the will of the technology and areas can be penetrated any time for communication abilities to the population,but imagine the irreplaceable natural free flying independent life cannot be “Re Done” or brought back to living form the way they once lived and Ruled the sky.When I look up ,all I want to the see is the white bushy clouds sailing the blue sky with the birds flying like fishes jumping in the sea as ships sail past them.I Don’t want to see those tall skyscrapers nor the sky poking communication towers or hear the sound of aircraft engines ..Wish for Just happy flying birds living in their natural environment.